Grade 1 brings the challenge of spatial placement of letters on lines, together with letter formation. 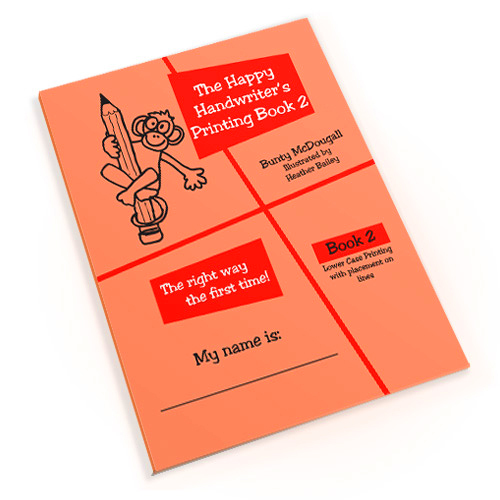 The Happy Handwriter’s Printing Book 2 integrates laying down the motor maps for letter formation in the correct pattern, along with correct spatial placement on lines for helping children with handwriting. Ideal for both home and school use, this unique research based approach allows for numerous opportunities for practise in the correct pattern, which is keeping with our motto of ‘the right way the first time®.’ Rainbow-letters® form the cornerstone of performing multiple repetitions of the correct pattern, while the delightful monkey guides placement with his head, tummy and tail. Research has shown that verbalising the directions of letter formation while mastering handwriting, contributes to laying down of the motor maps for handwriting in the brain. 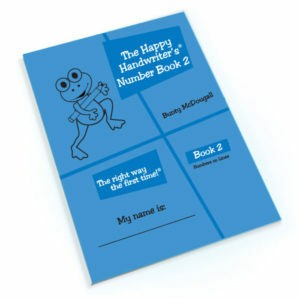 The Happy Handwriter’s Letter Formation songs, with their catchy tune, assists with the establishment of correct formations which are critical for speed and quality of handwriting, along with the correct orientation of letters. The carefully placed crocodiles facilitate the correct placement of the book for both left and right handers with the Crocodile Mouth®. Once your child has mastered the lower-case letter formations, you may move onto the upper-case formations in Printing Book 3. 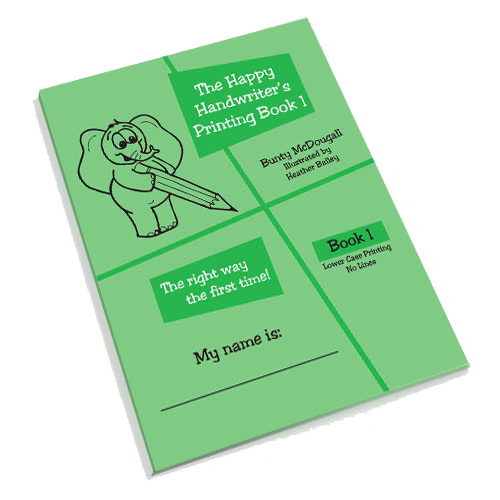 If your child is in Grade R take a look at the Printing Book 1. Start today with this unique evidence based handwriting system which will assist in helping children with handwriting and establishing this critical life skill.